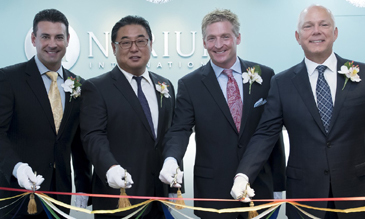 Opening of Nerium International's Brand Center in Seoul — Officials of Nerium International cut the ribbon to celebrate the grand opening of the Nerium Korea Brand Center in Seoul, Korea on June 23 (Tuesday), 2015. They were (from left to right) Mark Smith, chief field officer of Nerium International; BJ Choi, general manager of Nerium Korea; Roy Truett, president of international at Nerium International; and Dennis Windsor, chief networking officer. SEOUL, KOREA (June 24, 2015) — Nerium International™ celebrated the grand opening of its Korean Brand Center with a ribbon cutting ceremony held on June 23( Tuesday), 2015. On hand at the ceremony were Roy Truett, president of International; BJ Choi, general manager of Korea; Dennis Windsor, chief networking officer; and Mark Smith, chief field officer. Leaders of Nerium Brand Partner and its key partners also took part in the opening ceremony.